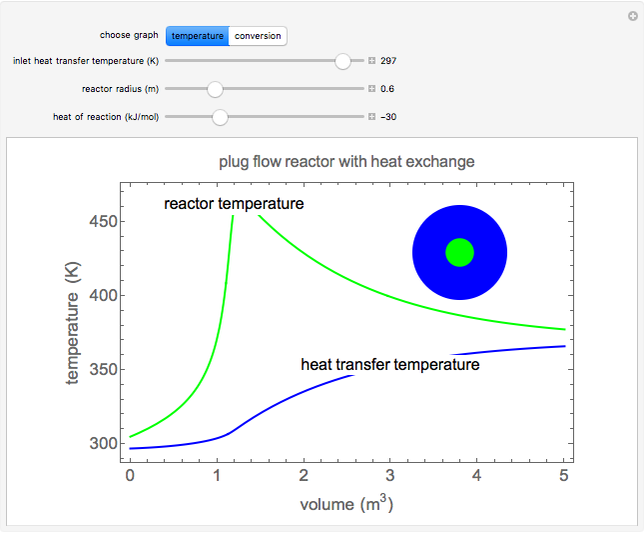 The temperature in a plug flow reactor and the temperature of the heat transfer fluid in the annular region around the reactor (a jacket) are plotted as functions of the cumulative reactor volume. Select "conversion" to plot fractional conversion of (for the reaction ) versus reactor volume. The reactor contents and the heat transfer fluid flow co-currently. A cross-section representation of the reactor (green circle) and the annular region (blue circle, which has a 2 m radius) is shown on each plot. Use sliders to vary the heat transfer fluid feed temperature, reactor radius and heat of reaction. 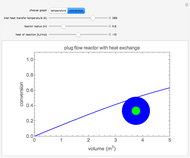 The reactant feed temperature is 305 K. The velocities of the heat transfer fluid and the reactant are fixed, so when the reactor radius increases, the inlet molar flow rate of increases, and the volumetric flow rate of the heat transfer fluid decreases. where is conversion, is volume ( ), is the reaction rate, is the molar flow rate of component (kmol/hr) that converts velocity of feed to molar flow rate of feed, is the velocity of component (m/s), is the radius of the inner tube (cm), and are the densities of the reactant and coolant ( ), and is the molar mass of (kg/kmol). where and are the forward and reverse rate constants (1/hr), is a pre-exponential factor (1/hr), and are the activation energies for the forward and reverse reactions (J/mol), is the ideal gas constant (J/[mol K]), is temperature (K), is the heat of reaction (kJ/mol), and is the inlet concentration of ( ). where is the heat transfer coefficient ( ), is the heat exchange area per unit volume of reactor (1/m), is the temperature of the heat transfer fluid (K), is the average molar heat capacity of reacting mixture (kJ/[kmol K]), is the coolant heat capacity (kJ/[kg K]), is the mass flow rate of coolant (kg/hr) which converts velocity of heat transfer fluid to mass flow rate and is the coolant velocity (m/hr). Simon M. Lane "Plug Flow Reactor with Heat Transfer Jacket"